But we did go back to the Irma for breakfast, where we sat in the antler-lined dining room and ordered buffet breakfasts. I doused my bread pudding and pretty much my whole plate in whisky hard sauce, which was boozy and sweet, and as good on the ham as it was on the pudding and pancake. It was hard work journeying west, and I overate in anticipation. Maybe I really like reminiscing about that hot, late summer trip because of all of the snow and sub-zero temps lately. Right now I can barely remember the sun it seems, or the sunburn that blistered my skin after days on the road. But I do remember that hard sauce, and my long food memory was good for rekindling some of that warmth for our New Year's Eve dessert. It's become somewhat of a tradition to go cajun on New Year's Eve, most likely because I leave the menu up to my Husband, and that is usually his request. This year I acquired the Heaven on Seven cookbook from my thrifting-genius friend Donna. That Chicago restaurant is one of my Husband's favorites, and the book has plenty of their menu staples. Of course, I generally use cookbooks as templates - which works good with heavy southern food. The recipe for bread pudding was so laden with sugar, I could tell I could slash it by 3/4 and no one would be the wiser. Before this book came into my life, I'd all but given up making bread pudding, since I was the only one to eat it. A New Year's Eve menu picked out by my beloved, and he wasn't sure he'd ever actually tried bread pudding... Finally, an excuse to do it up right! 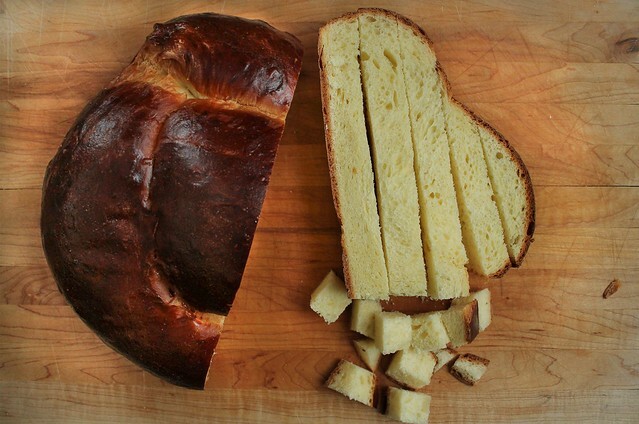 I started the day before by making a challah from Peter Reinhart's recipe. I forgot how marvelously simple his recipe is, and how perfectly burnished and beautiful the loaf ends up. 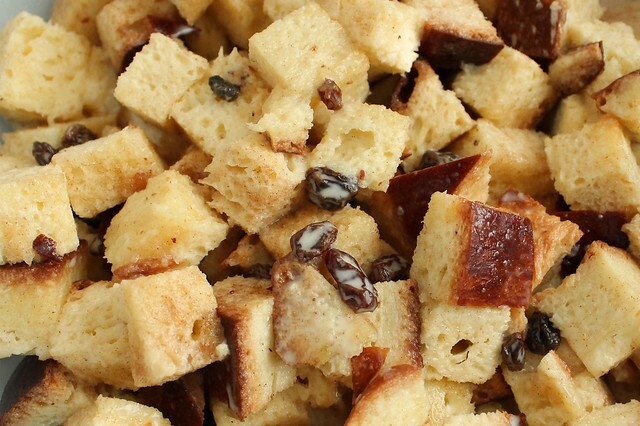 For an enriched bread, it's not too sweet or heavy: perfect for transformation into bread pudding. Unlike that first loaf I made without a stand mixer, I mixed this one up using the KitchenAid and it was even easier than I remember. I made a braid of three fat portions of dough, and came up with a nearly round loaf. 4 good size slices made the 8 cups of cubed bread needed for the bread pudding, with plenty leftover for toast and french toast. Jimmy Banos' bread pudding is served with a heavy caramel sauce, but like I said - I couldn't get a hard sauce out of my head. I took a cue from Nigel Slater and made up a boozy version of my own. Hard sauce, it seems, is generally made with softened butter, and is not at all melted like the small vat of whisky sauce I once poured over my plate in the American West. The heat of the pudding is supposed to melt the semi-solid, gritty sauce; I lopped a few spoonfuls into a saucepan and melted it for old times sake. Use the same small saucepan throughout the preparation to cut down on dishes. Bring brandy to a bare simmer in a small saucepan. Pour over the raisins in a small bowl, and let stand for 30 minutes to soften. Place the bread cubes in a large bowl. Melt the butter in a small saucepan over low heat, then drizzle it evenly over the bread cubes. Mix 1/4 t. cinnamon with 1/4 c. granulated sugar in a small bowl and sprinkle it over the buttered bread cubes. Toss gently to combine. 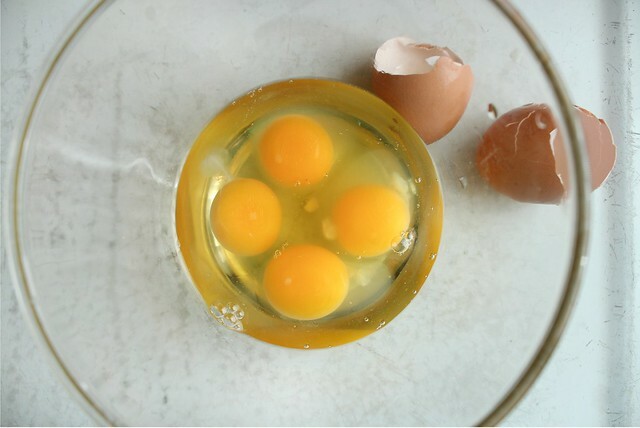 Crack the eggs into a medium bowl; beat to combine. 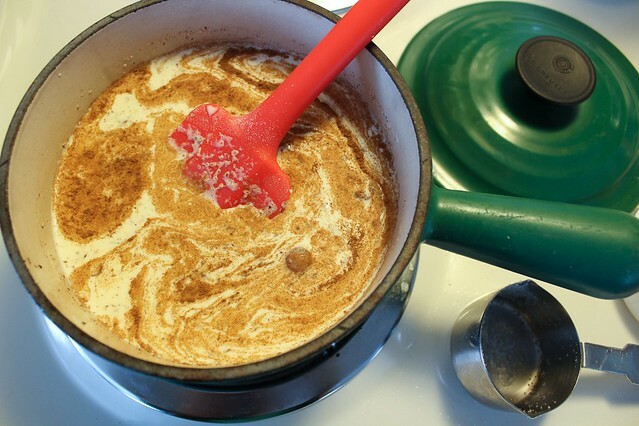 Heat the heavy cream, whole milk, 1/4 c. granulated sugar, 1/2 t. cinnamon, and as much nutmeg as you like in a small saucepan until just warmed through and the sugar is dissolved. Slowly beat the warmed milk mixture into the eggs and beat well to combine. Pour over the bread cubes along with the soaked raisins and their brandy, tossing gently to combine. Let stand at room temperature for 30-45 minutes until the bread soaks up most of the custard. Stir gently one time about half way through the rest. Preheat oven to 350. Butter an 8x8 glass baking dish, pour in the bread pudding, and place it inside a larger baking dish. Carefully pour in boiling water to come about halfway up the side of the pan (You can do this in the oven if you aren't too steady). Bake for 50-60 minutes, until a thin knife inserted in the center comes out clean. Remove from the oven and cool a bit before removing from the hot water. Serve warm, room temperature, or cold - preferably with hard sauce. Mix equal parts by weight of soft, unsalted butter and dark brown sugar. (I used 90 g. of each.) Beat well with a hand mixer until fluffy. Add a pinch of salt, and brandy by the tablespoon until it has the kick you are after - this was about 4 tablespoons for me. Store in the refrigerator, and serve on warm bread pudding or other warm kitchen baked goods. Or, melt some in a small saucepan for a pourable sauce. 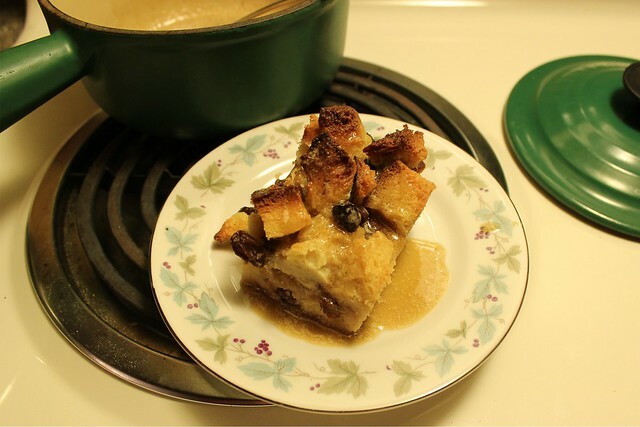 This bread pudding, despite the richness of ingredients, wasn't too rich or sweet. The quality of the ingredients let me appreciate each mouthful. It was room temperature by the time we cut squares out of it for our dessert; I poured melted hard sauce over, letting it pool a bit on the plates. Because it was New Year's Eve. Because is there any other way to enjoy bread pudding? Because even in the blanket of winter I like to think of the summer I was so hot and happily riding west, free from all worry and responsibility, with my Dad - who also loves bread pudding. It was the perfect sweet ending to the year.